Content in Yesteryear's Truth also contributes to the ongoing goals of the Wayfinders faction. This is one of my very favourite early SFS scenarios. I found that the starship battle was too long, but a slower launch rate of the combat drones, or less hp for each drone would fix that easily. I really loved the premise of this adventure. It’s very much a ‘first contact’ situation, and I thought it followed through on this wonderfully. Roleplaying this was one of the highlights of this scenario. As expected for a scenario of this kind, social skills are very important to the mission, which could be hard for some groups. That being said, they have plenty of chances to make friends with both types of locals, and the module can progress as scheduled even if they fail to do so. I loved the history this scenario lets you uncover, and that your actions can affect the planet’s future. I particularly like its ties to other scenarios, including Into the Unkown, Cries from the Drift, and Yesteryear's Sorrow. For those of us who game with kids, I'd like to point out that this is an awesome scenario to play with kids. Mine both adored it. This scenario is really fun if your character loves the 'explore' part of the society. And your character will have plenty of time to do so in this scenario. The story is great, I'll give no spoilers, with plenty of interesting choices with potentially big impacts for your character to take. The only thing making it 4 stars is the space combat, as it can take way too much time if things dont go your way. Good scenario. Excellent for a group of experienced players. Just ran this scenario, having never played it prior, for the first time. Overall, I think the scenario was good. I really like first contact scenarios, generally, and this one had some interesting twists. The fact that the results of that twist were put entirely into the hands of the players to decide about was a solid design choice. The combats were varied and interesting, and there was a plethora of skill checks to give everyone a chance to shine. While it wasn't needed for my group, I'm glad the scenario considered a party without a magic user and had a translation option for that. The starship combat was interesting to run as a GM with some key differences that kept it from feeling like 'more of the same'. My one critique is that, like many of the early scenarios, the starship combat takes too long. If you have a group that is optimized for Starship combat, and knows what they're doing, I imagine it would be a fast, fun, and exciting one. But with a party that isn't set up for it, it can turn into a slog (like most of them). In spite of that, critique, I highly recommend this scenario for anyone that likes the 'boldly going' and 'seeking out new life' type stories. I'd put it at 3/5 for new players or players that dislike Starship Combat, but 5/5 for experienced players that do. 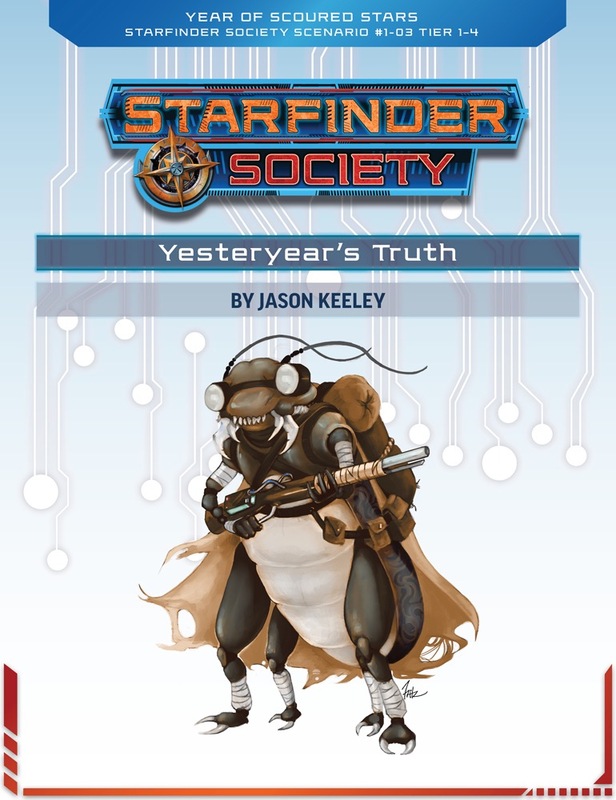 Yesteryear’s Truth was my second adventure in the land of Starfinder. I’m writing this from the perspective of a player from actual play experiences. If I had to summarize the scenario I would label it as having an interesting premise and setting, along with fun interactions with NPCs, but hampered by some of its combat set pieces. In the scenario the player characters are tasked to investigate a newly-discovered world, those who discovered it having been driven off from it by an orbital defense grid. Rather than considering that maybe the planet wants to be left alone and respect their sovereignty, Venture Captain Arvin explains the last ship just didn’t have enough firepower to deal with it, and sends you to investigate. Oh, and you’re told to make “peaceful contact” with them, which seems dubious if you’re destroying their defense systems so you can stop by and say hello. But I digress. After reaching the planet and dealing with the problem waiting in its orbit, you head on down to the planet. There is some unpleasantness, but then you make contact with some of the natives of the planet. What follows is some great interactions with the inhabitants, and an investigation into their past, and a decision on the part of the PCs that will affect the planet’s inhabitants one way or another. The non-combat parts of this adventure are great. The player characters get to interact with an all-new culture, and their can be a great deal of ethical dilemmas within the party based on people picking different sides on what should be done. If I were rating this scenario on the RP aspect alone it would get a four from me. As it is, however, the combats drag it down to a three. Yesteryear’s Truth has three combats, two land-based and one spaceship battle. I have to commend the author for how good the final battle is, as it felt like an even battle that neither side had an advantage on due to base power level, and that smart thinking was just as important as the luck of the dice. It’s not often that I find such in scenarios in recent times, and it was a very welcome change. The other two battles, however, were very problematic. In the case of the space battle, we went before our opponent on the first round, and I managed to score a critical hit for near-maximum damage, disabling the main schtick of our opponent. Two rounds later I scored another critical, and did a respectable amount of damage. With two criticals so early on it would seem like the battle would have gone fairly quickly. Instead the battle dragged on for around an hour, with our foe seemingly refusing to go down, and our success coming after we sustained significant damage. I was honestly left wondering how we would have ever managed to defeat our opponent without those two crits, given how we barely got by with them. I noted earlier Venture Captain Arvin comments the last ship didn’t have enough firepower to get by the orbital defenses, and I really don’t think the ship they send you in does, either. As for the other land-based battle, I was in a party consisting of a second-level envoy, technomancer and mechanic, and I was playing a first-level soldier. Our envoy went down in the first round of combat from our foe’s first attack, and I could plainly put the blame on that player’s decision to go in for meele. However, our opponent had such a high attack bonus that the only time he failed to hit us was on the sole occasion he rolled a “one” to hit. Aside from that he hit every time. Our mechanic quickly went down and I only managed to stay up because Constitution is my highest stat. I ended up having to flee, our foe chasing behind me like a reenactment of a Benny Hill chase scene, until our technomancer was able to take it down with shots and spells from a long distance. When our GM later told us he was attacking with penalities as part of the adventure’s adjustment for Tier 1-2, we were all looking at one another with disbelief that it had been penalized at all while we fought. If these two combats weren’t such a death zone, I would gladly give this adventure a 4. As it is I’m giving it a 3, and suggesting that GMs refrain from running the scenario for characters who are first level or not combat focused. I found the plot entertaining and the social aspect to be enjoyable. The session felt short and concluded within 90 minutes. Oh, yeah! Space archaeology! This reminds me of Babylon 5's Archaeology Corporation. "Exploring the past to create a better future." Can't wait to see a Starfinder version of the Shadows or Klicks from Alternity, or for that matter the Arachnids from Starship Troopers. And then just when the players think they're the bad guys, pull the rug out from under them and make the good guys in the scenario! And have the cute fuzzy "ewoks" be he evil race...bwahahaha!!! Mysterious signal showing signs of life? Check. Crack team of hardened explorers dispatched to check things out? Check. Uses the Basic Starfield Map so high chance of a space battle? Check. Am I a leaf on the wind? Check. Possibility that this whole mission is going to go FUBAR and we're gonna need an extraction as we fire machine guns at space monsters while running through the wilderness? Check, double check, and check mate. *grabs full auto railgun with the chainsaw grip* *ka-shunk* I'm down, let's do this. Exo-Guardian Dutch...how you feeling about this mission? Seems a lot like the movie Pitch Black after they crash. Turns out that this mission is actually mostly peaceful first contact with new species and mostly roleplaying :P With possibility of pcs causing great cultural shift for new species. There's at least one editing issue in this scenario. In the combat with the sand monster thing, the setup tells the GM to have the players place themselves in a dotted area, and then put the monster on the indicated space, but the map in the scenario features neither a dotted area nor an indicated space. The placement is answered in another thread (maybe the first wave clarifications one?). I just have to give mad props to Eleanor Jenner, the GM who ran this for us at DundraCon this past weekend. There's a part of the scenario where you read a bunch of information off a data terminal, and it reveals some key plot points. Rather than just reading us the info, or giving us handouts, Eleanor programmed a mock terminal. At the relevant moment in the scenario, she handed over her laptop and a tablet, and we were able to navigate through the menus to read the log entries and gradually come to an understanding of what happened - and she made it look like a screen from Fallout, which just added to the coolness. It was easily the best interactive visual aids, as well as one of the coolest moments, I've had in five years of PFS. This is a very "Star Trek" style story, with some combat encounters but mostly consisting of roleplay & diplomacy with various people. It also explores the impact on the native planetary society of an ancient cataclysm, and of their first contact with aliens (i.e. the PCs). In other words, it's much more *science fiction* in feel, rather than the *science fantasy/space opera* tone of most Starfinder scenarios. 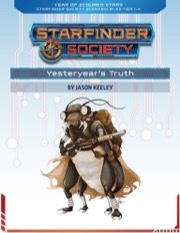 The above is probably why "Yesteryear's Truth" is my favorite SFS scenario so far, but it gets lower reviews from some.